Our Board of Supervisors and Staff are pleased to announce the 2016 Conservation Leaders of the year. We're honoring a diverse set of local leaders this year- from commercial farmers to urban residents and children to elders. One thing is for sure, this year’s recipients are an incredible group whose collective accomplishments are sure to inspire others to take action to make this world a better place. The 2016 winners have our staff “looking up” with hope, appreciation and inspiration for the future. We hope their leadership will have you, too, “looking up”. The following individuals, businesses and non-profits are being honored at the 2016 ceremony. Val Schroeder has been committed to promoting the Backyard Wildlife Habitat Program on Camano Island since 2002. Her leadership and perseverance has resulted in 866 certified properties on Camano Island! This accomplishment, in addition to her work with her Stanwood High School students that earned them the National Make A Difference Day award, along with her efforts to save Barnum Point on Camano island, are just a few of the actions that demonstrate Val's incredible leadership and enthusiasm for training the next generation and conserving natural resources. Largely because of Val's leadership, Camano Island became a Community Wildlife Habitat in 2005, the 10th community in the nation to be certified. Val was awarded the National Wildlife Federation Volunteer of the Year award in 2006 (for the 2005 year). Terry Myer transformed her lawn into an edible, sustainable landscape and then hosted classes almost every weekend last summer at her home in Lake Stevens to teach other community members how to convert their lawns into an edible paradise. 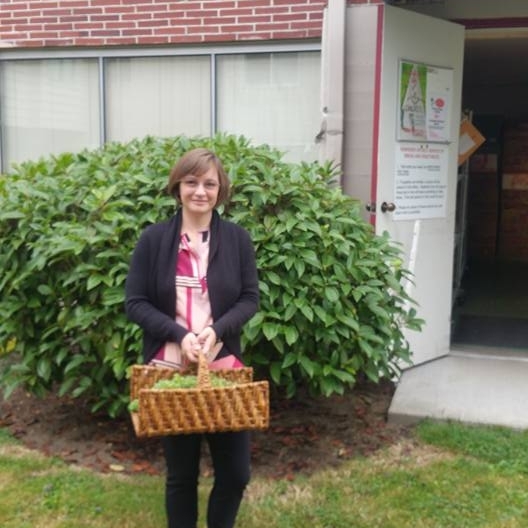 In the past year alone, she has donated 2,055 pounds of healthy produce to the food bank! Her latest project: spearheading a new community p-patch in Lake Stevens to ensure greater access to gardening for all community members. In addition to being a local food advocate and mentor, Terry is also a founding member of the Lake Stevens Being Neighborly Group, which provides opportunities for community members to help one another, offer acts of kindness and work collectively to make the city a "it takes a village kind of place. " Robbin Ballard installed several practices on her Stanwood-area farm to protect the land. They include diverting clean rain water away from her horse paddocks, using a winter holding area for the horses to protect her pastures and reduce runoff, adding covered manure bins, and protecting the stream by fencing animals out and planting a stream buffer. She also hosted a tour so others could learn from her work. Libby Reed restored the section of Woods Creek that lines her property in Monroe by planting a 2.8 acre riparian buffer (as wide as 180 ft) and graciously hosting several community planting events where students and community members could participate in the restoration process. She has been excited to be involved in the process, especially in the selection of plants (2000 trees and shrubs so far!). As much as possible, Libby wanted a working buffer, planted with native food-producing plants like crabapple, beaked filbert, highbush cranberry, Indian plum and salmon- and thimbleberry. She says “the great thing about this whole project was how flexible and willing the SCD staff were in the width, layout, and plant selection for the buffer”. She also appreciated how the plants were organized. In one zone, it’s geared for pollinators and is planted with shrubs that bloom in early and late spring to help support the pollinators. Working with the diversity of plants also helped Libby learn about our local native plants. LIbby is the owner/farmer at Orange Star Farm in Monroe, WA. A small farm supplying families and restaurants in Snohomish and King Counties with specialty produce, herbs and edible flowers. Tristan Klesick has demonstrated outstanding leadership in his role as the Agriculture Caucus Chair for the Sustainable Land Strategy in Snohomish County. Under his leadership, a robust conversation on the value and role of agriculture in salmon and Puget Sound recovery is underway – bringing together diverse stakeholders to create feasible solutions for all stakeholders. Tristan is the owner of Klesick Family Farms, an organic, non-gmo Community Supported Agriculture Operation. Greg Moga has restored his 100-acre farm property located in the Snohomish River floodplain near the City of Snohomish by removing barriers to open up a side channel that will allow salmon passage. In addition, he has planted trees, added pollinator habitat, eliminated dumping sites, removed invasive species and created a wildlife haven. His stewardship for the land is truly a model for others. Greg's project is the largest restoration project to-date that Snohomish Conservation District has completed in partnership with a private landowner. It wouldn't have been possible without the dedication and support of Greg. Greg is also on the boards of Nature Bridge - a non-profit organization committed to bringing children into National Parks to engage in hands-on environmental education- and The Nature Conservancy. David New improved fish passage on his property by providing countless hours of labor and engineering support to restore an important Coho stream, Bjorndahl Creek, in the Pilchuck Creek watershed near Arlington. He excavated a filled in channel, placing 40 pieces of wood and planting 37 acres of native trees and shrubs along a riparian area along his property. David was able to provide engineering expertise, on-site labor through site preparation and donation of woody material already present on site. The side channel created on his property will benefit salmon for years to come -enabling them to reach spawning grounds that were inaccessible before the project. Gail Walters - Under Gail's leadership, her Green Team students transformed a compacted patch into a sustainable landscape at Henry M. Jackson High School in Mill Creek. Her students have also removed invasive species behind their school and are currently evaluating potential green stormwater infrastructure projects to further reduce their storm water impact. Gail is an exceptional example for other teachers because of her outstanding commitment to engaging her students in relevant environmental projects. In addition to the above projects, her students have worked on reducing energy use and emissions from stalled vehicles at the beginning and end of the school day. Gail's students have earned their school the distinction of being a Certified Washington Green School. Rondi Nordal has been an inspirational leader in the evolution of the Students Saving Salmon club (SSS) at Edmonds Woodway High School. Her leadership has increased student membership in the club as she guided the creation of opportunities in civic engagement and citizen science to promote conservation and restoration of salmon habitat in Edmonds. She presented on behalf of her group to key stakeholders: The Edmonds City Council, Pilchuck Audubon, the Water Resource Inventory Area 8, and led an art project "On the Fence" which tells the story of Edmond's streams, infrastructure, and all the other factors that affect salmon runs. Additionally, she coordinated lab analysis and visits with students at North Seattle Community College, and participated in water quality monitoring of salmon streams. Rondi is a change agent and an inspiration to the City of Edmond's Mayor and City Council, along with teachers and so many students. She is a young leader that we'll probably hear more about in the future. As one Council Member said publicly, "Rondi is our star". Ben Rankin enthusiastically and energetically helped create gardens that beautified his school campus (Darrington High School) and his community. His efforts helped the town of Darrington become a semi-finalist in the competition for America’s Best Communities Award. Additionally, he has been honored as a Youth Trails Ambassador through the Washington Trails Association for his countless hours of volunteer time helping to maintain hiking trails. Dalila Habul has been a dedicated volunteer in the Olivia Park Elementary School garden in South Everett since it began in 2010. In recent years, she’s taken on a leadership role - welcoming families, mentoring younger students and signing older students up to volunteer in the garden. Her environmental leadership has been critical to a garden like Olivia Park which is a valuable resource for the families in her community. Dalila is a hardworking leader in her community. She has moved on to Explorer Middle School this fall, but her legacy continues through the students and families she mentored in the garden. Thanks to Dalila and her crew of volunteers, the students at Olivia Park have been given the skills to continue the care and sustain the Olivia Park Garden for the years to come. Jasmine Kraus is the leader of the group called "Nature Kids" at Olivia Park Elementary School in South Everett. As the leader of her team, she was able to get her fellow students working together to study the problem of litter. They counted and classified the litter and graphed how much and where they found the litter on their school campus. They presented the information and then worked to pick up and recycle the litter. In addition to helping to lead a litter campaign, Jasmine takes leadership in the garden at her school. She volunteers every Thursday - rain or shine - because she loves gardening and being outside. The Boeing Company has been selected because of their work to lessen their impacts to the environment. Boeing employee-volunteers installed a rain garden at their Auburn facility, engaged other employees in an Earth Day event to build rain barrels, installed a rain garden and spread mulch at an outdoor classroom. Boeing is now in the process of retrofitting their Renton facility to reduce stormwater runoff. They’ve also held several Lunch-and-Learns with Snohomish Conservation District to facilitate employee-awareness of stormwater best management practices. Boeing continues to innovate by testing the feasibility of using recycled carbon fiber to improve the strength of permeable pavement. The Nature Conservancy has taken a very unique and creative approach to advance numerous place-based conservation projects and initiatives in Puget Sound. They've recognized the value and need for local community-based activities, especially the critical role of local partners and champions. They've demonstrated that it is more valuable to support and guide than to impose their will on a local effort. This type of approach takes a unique style of leadership and a tremendous amount of courage, patience, and listening. Ron Shultz, Washington State Conservation Commission, Olympia, has gone above and beyond to support Conservation Districts statewide. He works creatively with others to find solutions to complex issues – moving forward some of the most difficult conservation-related conversations into a productive place.